Some books you simply read and absorb. Others take you on a journey, and leave you never quite the same. There are a few books that have given me that experience: The Golden Compass by Philip Pullman, The Chronicles of Narnia by C.S. Lewis. 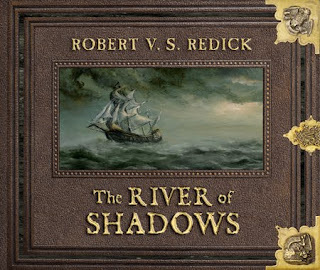 I am proud to give The River of Shadows by Robert V.S. Redick a place on that particular shelf. This is the third book in the Chathrand series, and sorry to say I have not read the first two, although I am well on my way to, as my British friend would say, "tucking into" the first one, The Red Wolf Conspiracy. So how did I stumble upon this one? For those of you that don't know, my day job when I'm not tapping away on this fabulous blog I listen to audiobooks. Yes, I get paid listen and proof audiobooks all day. It's okay, I know you're all jealous. When I saw this book come up on our projects list I knew from the synopsis I had to nab it. Ancient magical schooner? High seas adventure? Get me on board! And luckily enough, no one else had a burning interest for it, so I found myself launched headlong into the world of the Chathrand, and what a bewildering, compelling and complex world it is. It's the kind of book that will get under your skin, into your bloodstream, and stay there long after the last page or the book (or the last minute is heard, as the case may be) is over. I should warn you right now the book is a monster. At 592 pages, which translates to 24 hours of listening time, this is no light read. But let me tell you, it is worth every second of your time. The last book I developed a strong emotional bond with was The Golden Compass. I remember putting the book away and letting the tears flow freely - tears of compassion for the characters, for the bravery of Lyra, the main character, and tears that the book was over, and while I could always reread it again, I would never be able to have the new experience with it once again. 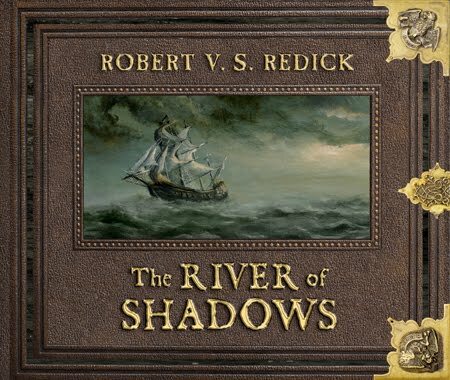 I felt the same way with River of Shadows, only MORE so because by listening to it, the characters had life breathed into them by the extremely talented British narrator Michael Page, who somehow has a unique voice for all of the myriad of characters that appear in this book. Being the third in the series, it takes a little while to catch up on what exactly is happening, but the author has a gift for weaving an extraordinarily complex tapestry of plot while giving us enough background to find our "sea legs" so to speak (please forgive the bad pun). The gist: the crew of the Chathrand, which is a huge floating palace of sorts, is comprised of several uneasy alliances and a race of small, pixie-like creatures called Ixchel who have taken several of the crew hostage, including the ship's captain. Led by young adults Thasha Isiq, a fierce warrioress the tar boy Pazel Pathkendle, and their compatriots Neeps and Marila, they fight through the social unrest on the ship to track down the powerful sorcerer Arunis before he gets a hold of - and learns how to wield - a powerful weapon of black magic called the Nilstone, which is aboard the ship. This is an extremely watered down summary of the plot. There are intrigues, people and creatures who are not what they seem, heartbreak and a very brave and loquacious rat with some VERY big dreams. This book will take you on a roller coaster of emotions, and Mr. Page's brilliant voice talents never waver for a moment. I have no idea how he was able to keep track of all the character's voices he did and keep them consistent and true, but somehow he did. What is so truly incredible about this book however is that while Mr. Page can give each character its own voice and inflection, Mr. Redick does a stunning job of creating a back story for said characters and giving them emotional depth. There are very few "side" characters in this book - like on a ship, everyone is essential, and everyone plays their part, from the lowliest tar boy up to the unpredictable and vituperative Capt. Rose himself. And many parts of the book will have you questioning the ethics of humanity - who is too young to do what - when you have young adults of 17 or 18 killing and fighting for their lives, taking on challenges way beyond their years, who's to tell them what becomes right or wrong in matters of the heart? It reminds me of an old, sweet song, that has a lyric, "They try to tell us we're too young, too young to really be in love......and yet, someday, they may recall we were not too young at all." I have waxed long on this book, but only because I will tell you truly - it is worth your time and money. And frankly, I can't wait to listen to the first two books (also available through Tantor Audio) because I know I will look at all these characters with new eyes once I have their previous histories under my belt. And I can't wait for more Chathrand voyages to come. The audiobook is available for purchase now here. The hardcover is now available! Please click here for more information about the Chathrand series. I just listened to the Ruling Sea (book 2), and I can tell you that Redick and Page are in top form here as well. You'll love listening to this one I am sure.